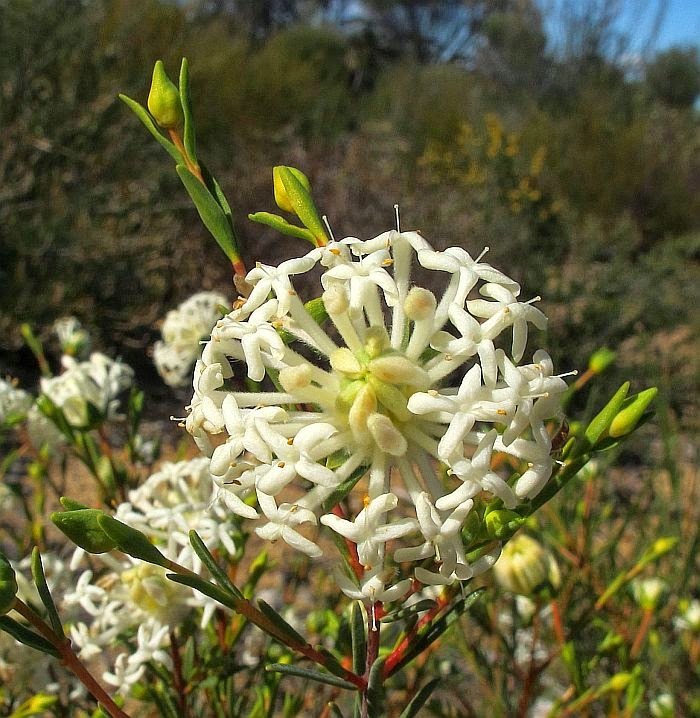 Pimelea angustifolia is a WA endemic, but is one of the most widely distributed Pimelea species in Western Australia. It is found from Kalbarri (500 km or 310 miles north of Perth) around the coast to the SA boarder, plus as far inland as Menzies (120 km or 75 miles north of Kalgoorlie). 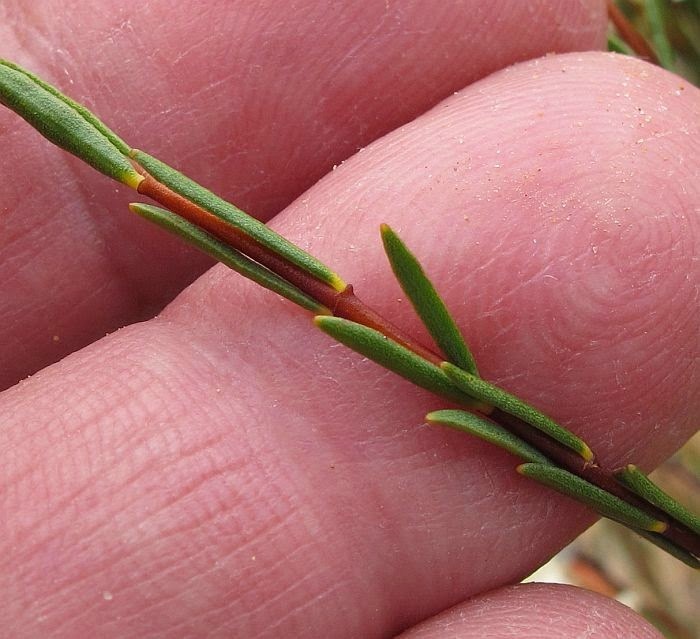 With such an extensive distribution that includes several climate zones, it is therefore not surprising P. angustifolia is a highly variable species. 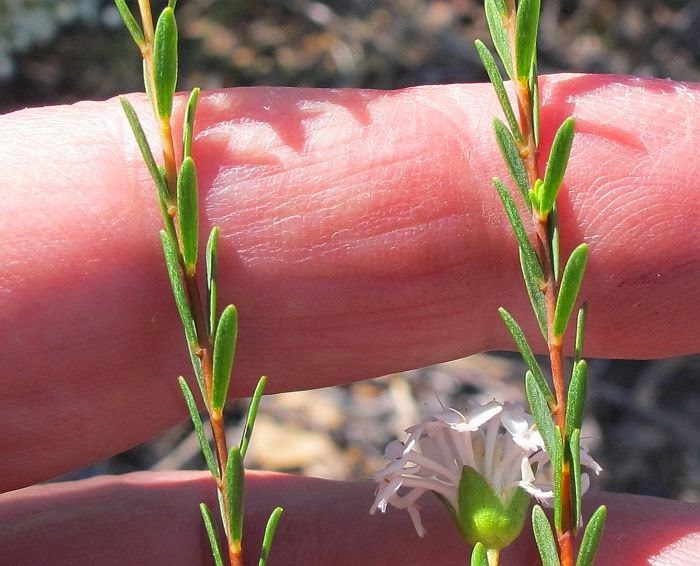 Just on flower colour alone, P. angustifolia can be pink (around Albany), or yellow elsewhere, but is more commonly white or cream, which is the case around Esperance. It also has a wide tolerance of habitat that range from gravel, to clay or a limestone substrate, generally with a sandy covering, it will also tolerate conditions varying from seasonally wet to very dry. 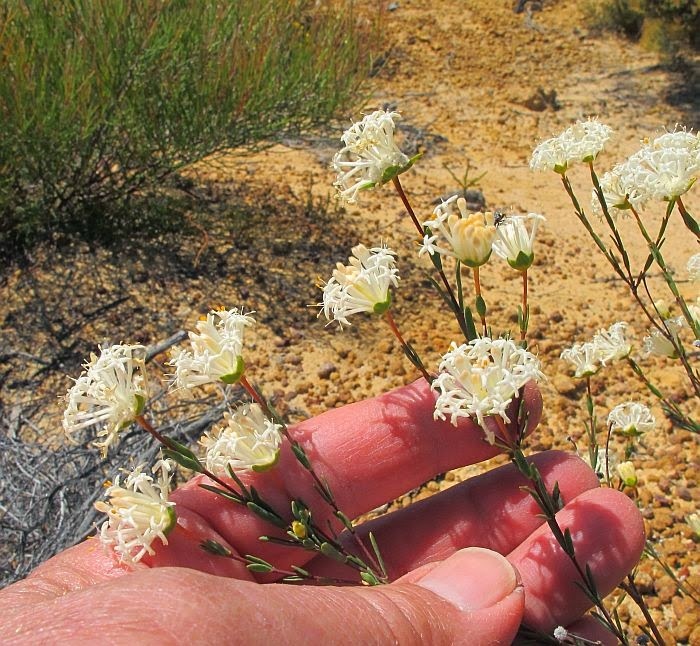 So Pimelea angustifolia is a highly variable and adaptive plant. As the species name suggests, the leaves are usually narrowly elliptic to linear and up to 3 cm (11/4”) in length, but maybe flat or concave, with acute or obtuse tips. There are mostly 4 involucral bracts (base of flower), but apparently in the NW portion of its range, there can be 6. However, what is reasonably consistent are the hairs on the bi-sexual flowers, with those below the circumscission point (weak ring, usually just above the ovary, where the upper flower, when dead, brakes away) are longer, more dense and coarser than the fine hairs above. The discarded upper portion of the floral tube is hairless on the inside. 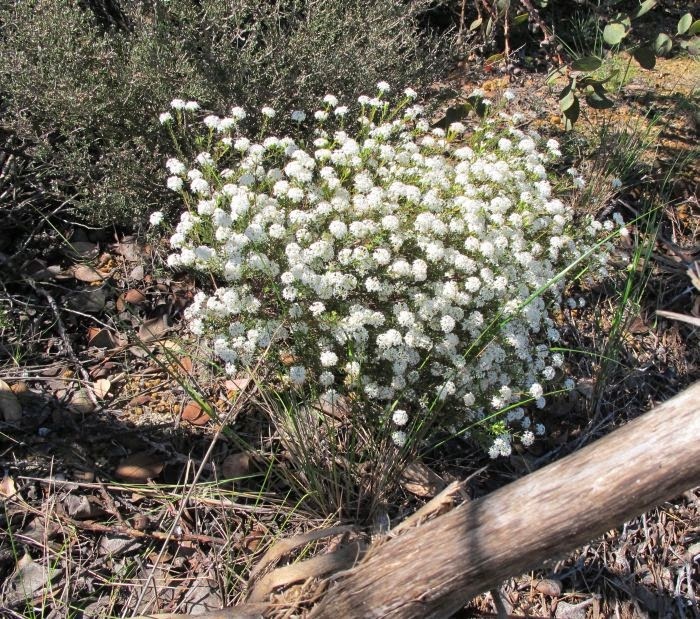 As you might be gathering with Pimelea plants, the size and type of hair, growing on what portion of the plant, are important identification features. 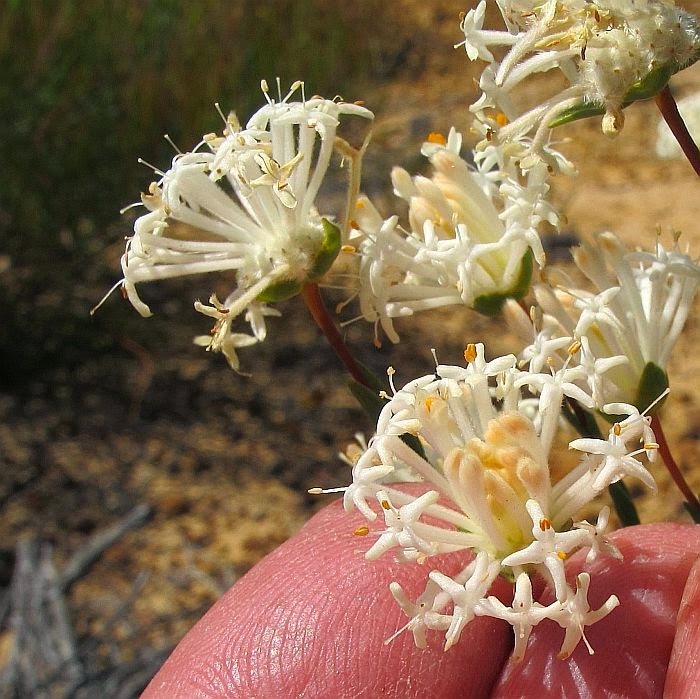 Pimelea angustifolia, tends to be a colonising plant, with strong germination after bushfires or soil disturbance, but is slowly pushed out when the growth of taller and more vigorous vegetation overtakes them. 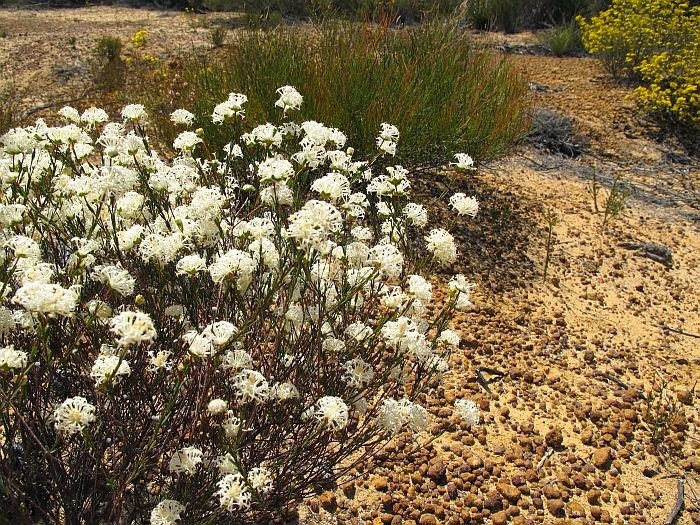 The flowering time as with most Pimelea species is quite lengthy, with fresh flowers being produced continually, which with this species and depending on local weather conditions, can be anytime from July to February. 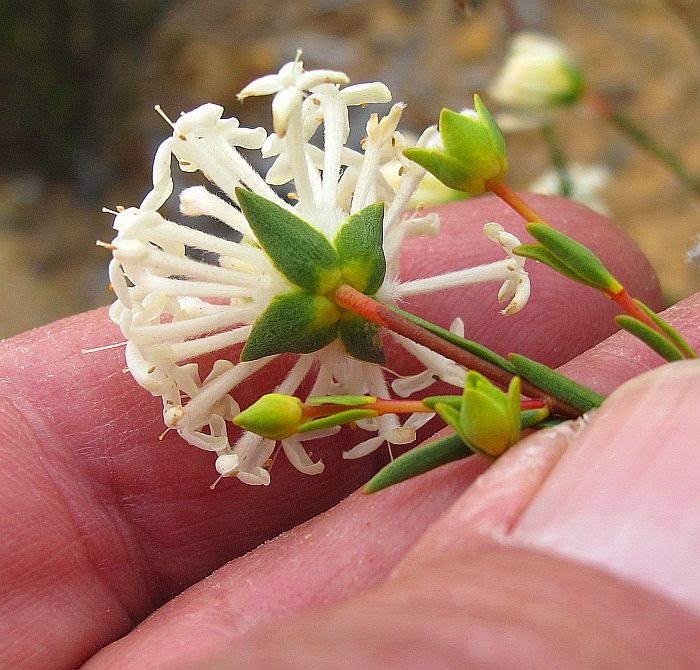 Pimelea is part of the Thymelaeaceae family, which are commonly known as Riceflowers. Nuytsia Vol 6. No 2. 1988.